When I saw Laura's Sketch #32 on 2Sketches4Y, I wanted to create a card for Simon's teacher when school starts up. I pulled some papers and really tried to make a back to school card but my heart wasn't in it as I still haven't found a teaching position for the school year. I stacked up the stuff to make Simon's teacher a card and put it back for later. 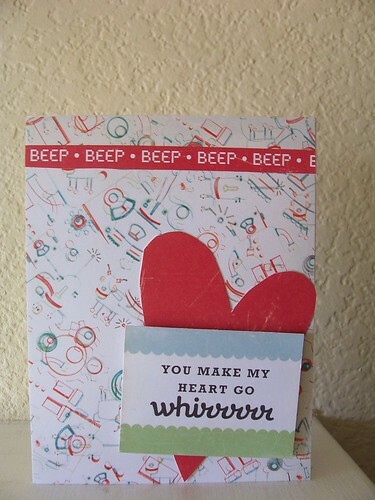 I pulled out some robot paper by Cosmo Cricket and set out to make a card for Simon. Originally I planned to use a robot stamp I have from See D's but then I found this tag in my paper pack and knew it was perfect. I think Simon will like finding a card one day in his lunch box. This turned out to be a really simple card. Everything came out of the robot paper pack. I cut the heart out of one of the solid sheets of paper. Super cute card! Thanks for playing at 2S4Y! love the sentiment! such a cute card!